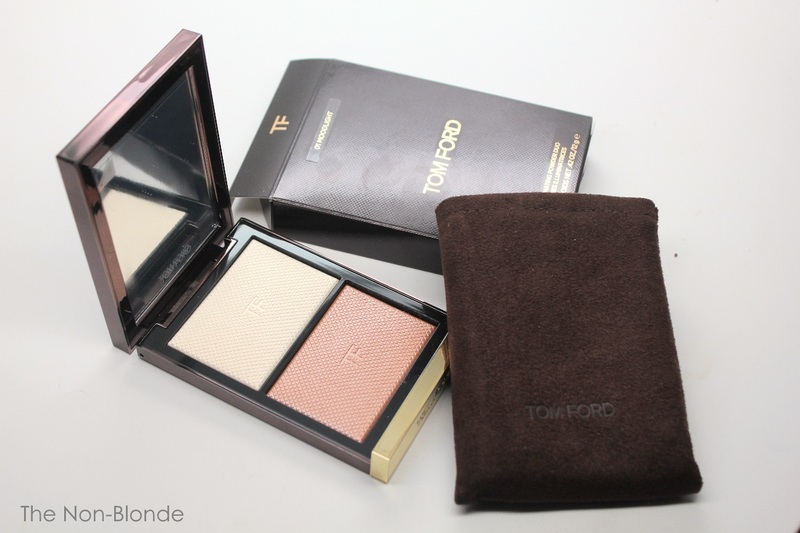 Tom Ford Moodlight Skin Illuminating Powder Duo is kind of a weird product to buy at the tail-end of summer, but it was actually released in late July (right along with all the fall collections). I've been testing it for a while, and it's actually rather timeless, other than the general concession to the high-illuminating trend that has been going on for a while and doesn't seem to be leaving us any time soon. I bought this face highlighter because these particular shades fit a vacancy in my collection. Also: so very pretty. 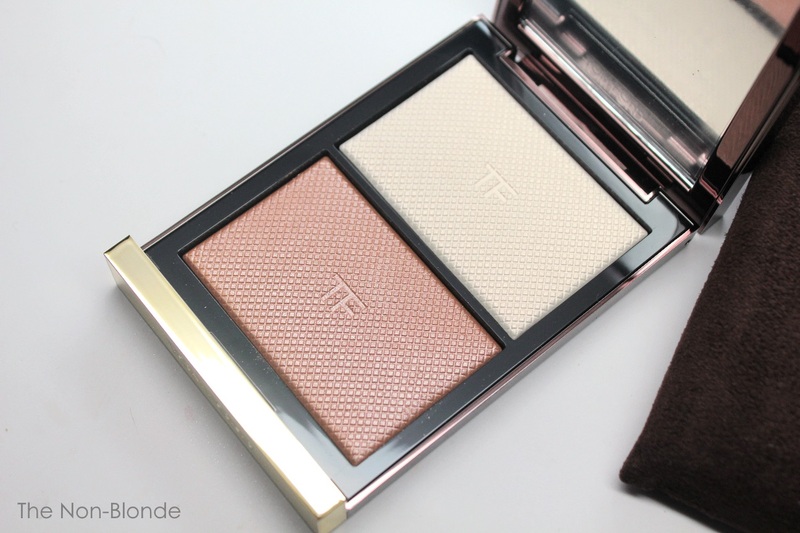 The first thing of note is that while Tom ford Moodlight is a powder duo, it's two separate products in one one compact, and I wouldn't advise anyone to use both colors at once (I stick to the "one shiny item at a time" rule). The lighter shade an off-white gold highlighter in an extremely refined texture. 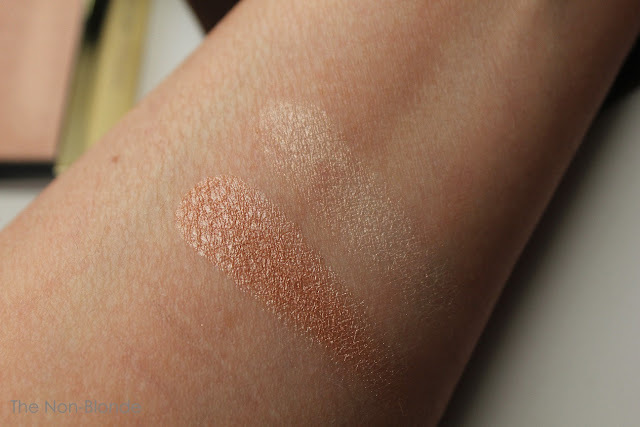 The color appears almost neutral on my skin, the powder is as finely-milled as they come, and the effect it creates is subtle enough for even casual wear. I use various Hakuhodo highlighting brushes, usually in the patting technique (watch Jung Saem Mool videos if you're not familiar). It also works as a subtle highlighter in the eye area, or with a fluffy brush for a touch of an over-all face non-shimmer. The pans are large enough to fit any brush; as I said; each side is a full-size separate product. The darker highlighter is a bit trickier and took me a while to figure out the best way to use. First, as you can see, both the color and the sheen level are much more intense. It's like an almost metallic bronzer, and I don't do a metallic bronzer. The first order of business is to find the right brush. It depends on your skin tone, really. I'm sure a woman of color with a lively undertone can rock this on her cheeks better than me, as would anyone with a (hopefully fake) tan. 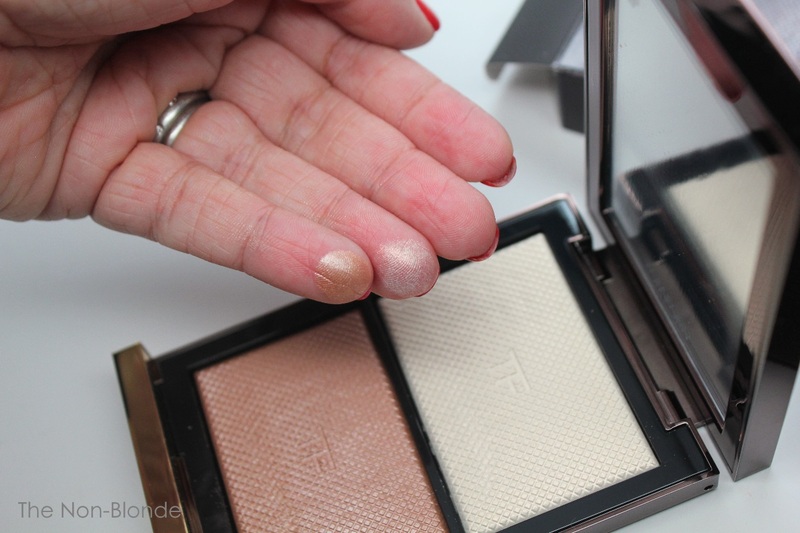 The color pulls sunshiny gold on me, almost coppery on some areas of the face, and looks great on the lids or on top of a cream blush on some areas of the face, applied with the fluffiest of brushes, something like Hakuhodo G5538 or a small duo-fiber. Hakuhodo smallest Yachiyo is also good for this, especially the non-pointy one. Both powders wear very well, no matter what part of the face I choose for them. The finish and color remain lively and fresh for a full day (obviously there's a good base underneath). They integrate well into many looks, including the more dramatic transitional ones, as well as full-on fall looks. A more intense application will carry this shimmer-shy beauty blogger into the holidays just as easily. Bottom Line: why, of course! 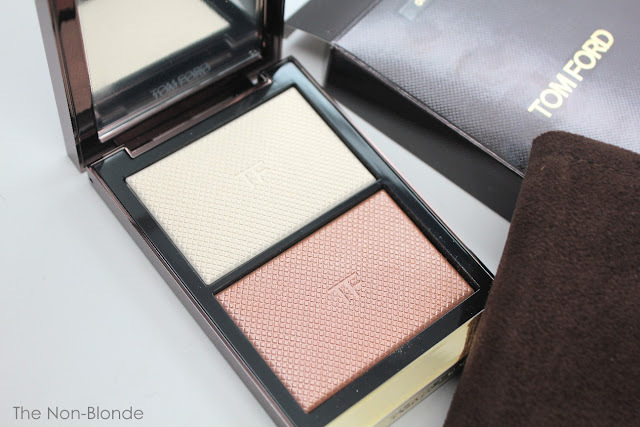 Tom Ford Moodlight Skin Illuminating Powder Duo ($80, made in Italy- not France as stated on Saks website) is a limited edition item, currently available at Nordstrom, Saks, and most other Tom Ford counters and online. I'm so glad I was able to find one of these! Nordstrom is completely sold out online, and in their stores. PSA: Saks still has them, and today (9/7) the code EBATES15 gives you 10% off and there's free shipping! Yippee!